What [your aunt] calls “the Memphis factor” is much too widespread to be identified with only that city. However, I do believe it’s especially evident in the South. A good example occurred yesterday when a friend of a friend here in Little Rock had a “going away” party for a lady in her office. One of their supervisors called the Little Rock Wal-Mart and ordered the cake. 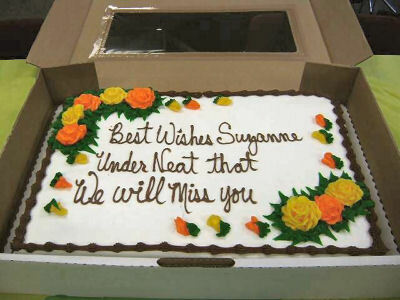 “Best Wishes Suzanne” and underneath that write “We will miss you”. The attached picture shows how the cake turned out..
I’ll spare you my analysis. This entry was posted in Fun on October 26, 2007 by Chris. Seriously, that is one of the funniest things I’ve seen in a while! I can’t believe anyone would REALLY be that dense, though. Kinda sad.